FreePriceAlerts by myVBO LLC - Boost Your PC. FreePriceAlerts from myVBO installs a web browser extension such as an Internet Explorer Browser Helper Object (BHO) to view web pages loaded and looks for affiliated merchants in order to possibly provide better pricing or alternative deals on a given product or merchant. Basically if FreePriceAlerts has a pre-arranged affiliate relationship with a similar merchant it will alert you when you visit through your web browser. Alternative prices and other product information will then be displayed in your browser for comparison. When visiting one of the domains on the limited list, the FreePriceAlerts add-on will send the product or service information you are viewing to its servers in order to search for alternatives. Download Boost and enjoy your PC. Remove FreePriceAlerts from your PC. Why should I uninstall FreePriceAlerts? Removing unwanted web browser extensions is typically a good idea. FreePriceAlerts installs as a Browser Helper Object within the context of Internet Explorer, and like many browser extensions can cause potential stability issues once loaded. To the right of the list item, click the Uninstall button and Boost will completely remove FreePriceAlerts from your PC. Use Add/Remove Programs control panel in Windows makes to uninstall FreePriceAlerts. Follow the appropriate instructions below to use this control panel. Select FreePriceAlerts from the list of programs, and click Uninstall. Alternatively, right-click the program and select Uninstall. Select FreePriceAlerts from the program list, and click Uninstall. Alternatively, right-click the program and select Uninstall. Select FreePriceAlerts from the list of programs and click Remove. 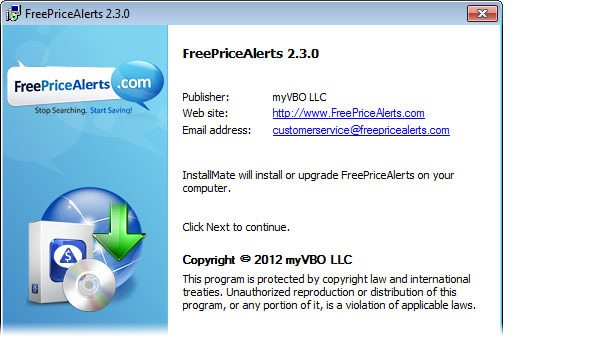 Boost helps you remove FreePriceAlerts by myVBO LLC and clean your PC.